The Vincennes porcelain factory had a link to the French crown from its inception as it was established in about 1740 in the semi-abandoned royal fortress of the château de Vincennes to the east of Paris. There, a handful of porcelain specialists devoted themselves to solving the technical challenges of porcelain production as huge sums were paid by wealthy aristocrats for this glassy white substance which, up to then, was mostly imported from East Asia or the Meissen factory in what is now Germany. (In Europe it was the Saxon ruler Augustus the Strong who had led the drive to emulate Chinese porcelains, and his Meissen factory was established in about 1710.) 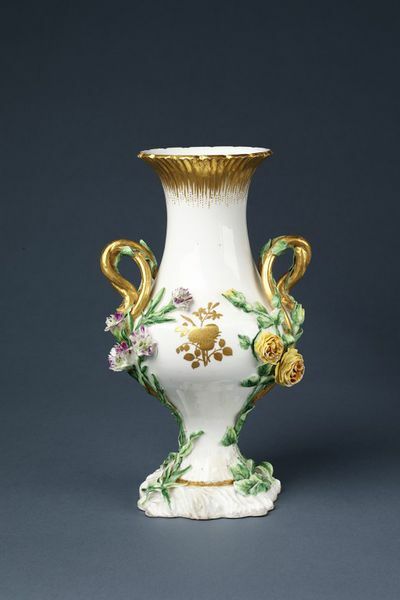 During the early 1740s the majority of the Vincennes factory's products were probably experimental as the porcelain body was still being perfected and different enamel colours invented. In 1745 however, they secured a royal 'privilège' which granted them the exclusive right to produce porcelain ‘in Meissen style’ in France. As the wording suggests, the factory's earliest productions were indebted to the prestigious Meissen factory. The factory's repertoire quickly evolved however, from the emulation of East Asian or Meissen examples to incorporate the latest styles used in French gilt-bronze, woodcarving and decorative painting. The financial support and patronage of King Louis XV and his mistress, Madame de Pompadour, enabled Vincennes to secure the best technicians, artists, sculptors and designers. Jean-Claude Duplessis (director of models, 1748-74), Jean-Jacques Bachelier (director of decoration, 1751-93), Etienne-Maurice Falconet (director of sculpture, 1757-66), and the court painter François Boucher, all played a central role in the development of this entirely new French art form. By 1756 the factory had outgrown its workshops in the old château and it transferred to specially constructed premises at Sèvres (south-west of Paris). In 1759 the king purchased the factory outright and remarkably the Sèvres porcelain manufactory continues in production to the present day. 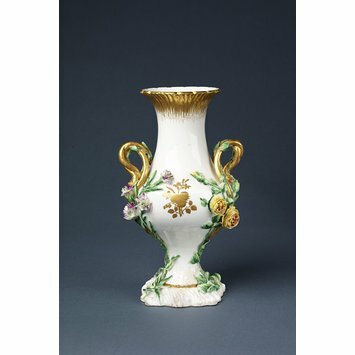 Vase, porcelain, painted in enamels and gilt. From a set of three with C.358-1909 and C.359-1909.